Hey there Whores of Mensa Fans! There’s been a lot going on at Whores of Mensa HQ this month, so perhaps I should take the time to introduce myself. I’m Elliot Baggott, a second-year BA student at Wimbledon College of Art. For the past month I’ve been the official WoM Intern, helping Editor Ellen get everything ready for exciting anthology news and changes to come! But first, we have a special surprise; the digital return of long out of print Whores Issue One! 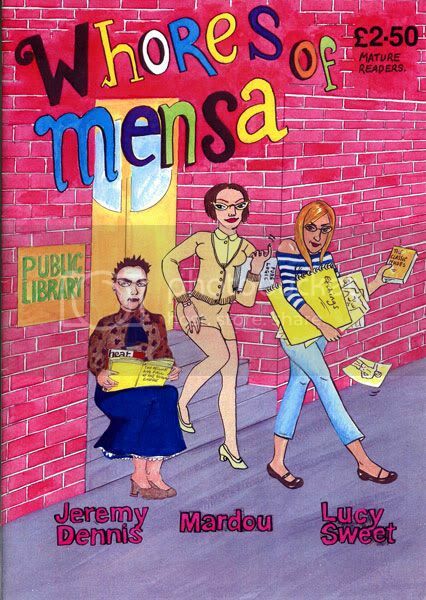 It’s been nearly seven years since Whores of Mensa first hit the British Comics Scene. Jeremy Day (then Jeremy Dennis), Mardou and Lucy Sweet met while promoting comics at Ladyfest Bristol in 2003. Since then, these ladies - with the addition of Ellen Lindner, and in Issue Five, a bevy of guest artists - have been flying the standard for women in alternative comics and producing their own brand of smart, quixotic cartoon stories. We’re currently preparing our sixth issue - and Issue One is the best possible way of seeing how it all began and really getting a flavour for the tone of the anthology as a whole. Last, but by no means least, Mardou spins a dystopic tale of a horrifying future without comics in “Fahrenheit 50/50” and rounds off with “Dojo of Love!”, a comic about a very unusual inter-generational love affair. Here, with no further ado, is the link to download your own copy in PDF format. Issue One is free to download, but if you have enjoyed reading then please consider donating. All your donations go towards financing future WoM projects and paying for printing costs, and help to keep this wonderful anthology going! Elliot Baggott’s personal blog is http://surrealistetiquette.blogspot.com and his latest comic TEETH is available at many comics stores in London or by direct order. The New Thing: London Comic and Small Press Expo This Weekend! I'm very excited, because this weekend the London Comic and Small Press Expo is coming to New Cross! New Cross is also the home of the Fleece Station, the studio I've shared for the last year-and-a-bit with Gary Northfield, Lauren O'Farrell and Sarah McIntyre. Here's a map of some places I like in New Cross, or that have been recommended to me - New Cross high street can look very forbidding, but there are a few real gems, and if you get into Deptford - well, everyone's got to experience Deptford just once. Especially now that you can get bubble tea on the way in! Some quick notes: Meateasy is FAB for greasy American diner food (exactly what you came to New Cross for, I imagine) - but it's only open after 6, and the waits are almost as legendary as the chili dog. If you're serious about checking out London's most talked-about popup restaurant, get there before 6. One thing I haven't covered: transport. 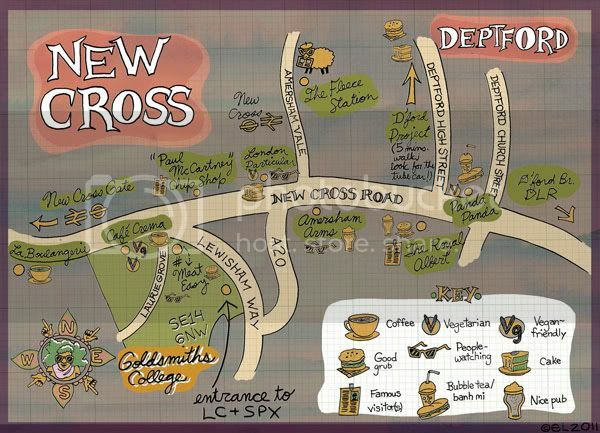 New Cross is accessible by rail, Overground and loads and loads of buses - too many to cover here! Check out the London Transport Journey Planner instead. Please let me know if you have any questions about my map - there's a bigger version here - and hopefully, I'll see you at the show. Look for me at the Fleece Station table - I'll have Undertow, Whores of Mensa, and some great little prints Sarah and I have done just for the show.